Kreate With Me 2: Twisted Thursday!!! Well, it's obviously time for another Twisted Sketch LOL! Can you tell that I'm enjoying these sketches....it is one of my fave challenges besides inspiration ones so thanks ladies for another fun twist.......what's the twist? Add ribbon to your creation---tooo stinkin' easy as that 's my fave embellishment!!!!! I also enjoyed playing with my favorite punch and adding a bit of bling to that gorgeous rose! I hope you like it as much as I do!!! I have a hair appt. tomorrow, stamping with my downline on Saturday & some unpleasantries to deal with @ the beginning of the week so I'll be busy stamping and pre-posting so you'll have something new to see. Thanks so much for stopping by & have a great rest of the day! this is so very pretty! love the layers and colors! Stamping with your downline huh? Guess I have to get moving on my project-LOL!!! yet another FAB card...LOVE how the big flower has just a tinge of colour..
Jackie, this is just breathtaking! That rose is so incredibly elegant and intricate and your interpretation of the sketch is faboo!! You ROCKED it missy!! Thanks for playing! Spectacular card, Jackie, Gorgeous take on the sketch. Awesome choice of stamps and colors. Thanks so much for taking part in the TT challenge. Hope you win! I love this color combo, Jackie! You rocked this challenge! Another beautiful card Jackie! I love the glitter on the flower. The textured background and triple border punching is so elegant with this image. So lovely. I'm adoring those layered borders! 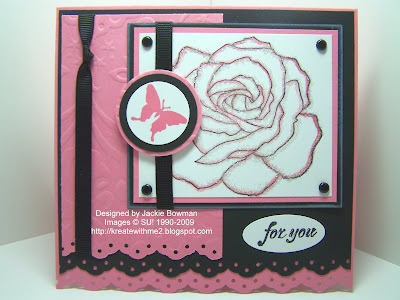 Jackie- your cards just get prettier and prettier!! This is no exception!! Love all the layers and the eyelet border punch! I really like how you knotted the ribbon and the layered butterfly...just perfect! your blog is one of my fav stops every day..
Anyways I do love your card, you did a wonderful job on this, and love the colors and its very very pretty!!!! I love your layered border! Great colour combination! STUNNING! Love the border treatment and the colors together! This is GORGEOUS!!! I love the glitter you added to the flower too! Have a great weekend! WOWZER Jackie!! This is one gorgeous creation!! Love it!! ;) TFS! Oh my gosh, Jackie, this is GORGEOUS!!!! I just bought that flower set! I can't wait to get it in!!! Hi Jackie! This card is just gorgeous!!! Love the colors and the sketch is really a keeper! I love this stamp more every time I see it! Great work! I just found your blog... I'll be back... you do such great work! WOW, just georgeous! love the color combo and the scallop edge! I sooo need that punch and that embossing folder... they are definitely going on my next SU! order! Second comment on your beautiful card, I love the scallop border punch on the bottom is that the Martha Stewart one that is so popular? TIA! I love what you've done with this rose and layout. Splendid! Wow, Jackie, this is a knockout! love it love it love it! Love how you lined up the scallops-impressive!! Jackie, for got to ask you how you did the edges of the rose. It looks like it has color and glitter. BTW I see that we are signed up for some of the same SCS swaps at convention. We'll get to meet in person! What a great card, I love your color combo. Thank you so much for the Shout out regarding our Challenge and of course for coming out to play with myself and the other Ladies with Attitude. Good Luck and we will see you at this weeks Twisted Thursday Challenge. Jackie, your card looks absolutely fabulous! oh, you are making me want this set and bad! LOL! Another gorgeous creation!